The Honeywell 5877GDPK is a garage door control kit. 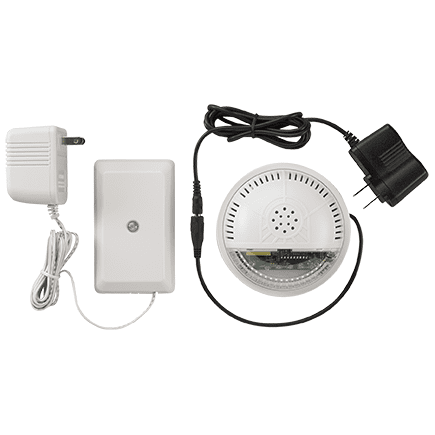 The 5877GDPK includes the 5877 relay receiver and a SSA1 Z-Wave® wireless siren and strobe alarm. It provides an audible and visible warning that the garage door opener is being remotely activated. If the system has been equipped for garage door control, installation of both the 5877 and SSA1 is required for remote unattended garage door control. The installation of a 5822T Tilt Sensor or Door/Window Transmitter (i.e. ; 5816WMWH) allows the control panel to provide the status of up to three (LYNX Touch) or four (Lyric Controller and Gateway) Garage Doors (one transmitter per door). The System can be armed when the garage door is open, and once the garage door has been closed, the zone will be monitored as part of the security system. It can also be programmed for monitoring only without providing burglary protection. The LYNX Touch and Lyric Controller panels also feature the option to automatically close the Garage Door(s) if it has been left open for more than a specified (programmable) period of time (Close in) or at a specified time (Close at). The LYNX Touch L5100, L5200/5210, or L7000 Control Panel must be equipped with the L5100-ZWave home automation module. The 5877GDPK is not compatible with: Chamberlin/Lift Master MyQ technology (Including but not limited to; Models 8550, 8360 and 8500), One piece or swinging garage doors. Garage door control must have working entrapment protection (automatic reversing mechanisms and electronic photo eye sensors that detect obstructions). Both the 5877 Relay Receiver and the SSA1 Siren Strobe must be installed. Programming for the Lyric Gateway is accessed via the MyHome Gateway app Home screen.